Dolly belongs to a very select group of horses comprised of exceptional individuals who do their work consistently and well, but without much recognition. Linda Levy finds these unsung heroes on Craigslist and transforms them into happy working partners for herself and her riding students. Linda, who is as modest as Dolly, works her magic with students of all ages and levels. It feels good to be around Linda and her horses because everyone’s needs are being met. The only overworked member of her team, most likely, is Linda herself. I’ve been seeking just such a kindly, professional environment for a long time. When my mare, Miss Annie, passed away in 2008 I developed a full blown case of Fibromyalgia that left me debilitated by severe muscle and soft tissue pain in my shoulders, arms and hands for over five years. I didn’t know if I’d ever be able to ride again, let alone be pain free. During the worst of it, general arm movement and even holding a pen, typing, or opening a letter caused horrible, long lasting pain. In addition, I experienced massive fatigue. I found myself in bed, or on the couch watching TV, with my arms supported by a pillow, for days at a time. Daily chores were done one at a time over several days. As they say, “If it doesn’t kill you it will make you stronger.” I approached this condition from a holistic perspective and an unwavering will to heal. Today, seven years later, I am pain free. My body isn’t as strong as before and I’m still overcoming the consequences of five years of inactivity, but I’m back on a horse and I walk around my neighborhood at a brisk pace several times a week. When I have a setback and get frustrated or impatient, I remind myself that I’m turning sixty-three this month, that things have turned out rather well, and I’m fortunate and grateful. What I lost in physical strength I’ve gained in patience and inner strength. Several horses and their trainers have helped me get back on my feet and back in the saddle. 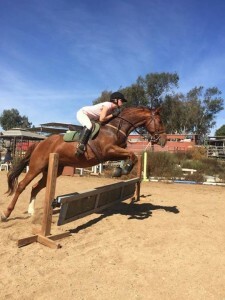 Thanks to Abby Kogler in Fallbrook and Philippe, a big, well-trained, wise and calm warmblood gelding of twenty-five years, my desire to be around horses again became a reality. Abby had worked with special needs students and she gave me horse therapy sessions. I sat on the horse and learned to move again at a walk, using my flabby, weak muscles, while Abby safely held the lunge line to the horse’s head. Abby’s life became too busy to continue so I moved on to Evy, the handsome Friesian on my website picture, at Cook Training Stables in Del Mar. After six months with the marvelous Evy, I sustained a tailbone injury and pulled an inner thigh muscle. Ugh! During my recovery period, which was again spent on the couch, Evy was sold, so there was no going back to him. When I was well enough, I tried a lesson horse on another ranch in Del Mar. Unfortunately, she was so tired and worn out by her job with kids that I cut the lesson short. For the following few weeks, I took lessons from Janet B. Reed in Poway, on a sweet large-boned black mare named Roma. Unfortunately, the commute to the facility in Poway was often quite lengthy due to traffic. By that time, I had pretty much made a big circle around San Diego County. Was I ever going to find a compatible lesson horse and place to ride? Early on in my quest, I had explicitly stated to Cheryl Erpelding, who knows most everyone in the horse community, that I wasn’t interested in returning to Lakeside or East County in general. I had spent 20 years in that heat and dust with Miss Annie and I was done. (Read…I’ll NEVER ever go back—been there done that.) In April of this year, I did return to Lakeside to do the blog about Cheryl and Joey, the rescued thoroughbred. Cheryl boards her horses at the Triple S Ranch in El Monte Valley, a beautiful verdant (for SoCal) spot surrounded by cultivated fields and the El Capitan preserve. After that experience, I was drawn to periodically check on Joey with Cheryl and, little by little, I let go of my mindset about returning to East County. I remembered Triple S Ranch from years past and it had always been a pleasant place. This led to Cheryl introducing me to Linda Levy and her ten year old lesson mare, Dolly. Dolly is a small horse who is a Norwegian Fjord/Quarter Horse mix, which is a rare combination because Norwegian Fjord breeders usually do not cross breed. She is cute with her golden coat, warm brown eyes, and distinctive Fjord striped markings on her legs. Compared to Abby Kogler’s tall, monster horses off the jumping circuit, the hefty Friesian Evy, and my big Miss Annie, Dolly felt like a pony. Dolly forced me to confront my second NEVER: “I am not drawn to small horses, and I will never ride a small horse”. Thankfully, Dolly and Linda got me over that silly mindset quickly and, as it turns out, Dolly’s size is very well suited for my currently delicate body. Dolly is wonderfully special, and Linda agrees with me that most of her students have absolutely no idea that she is such an exceptional horse. They take for granted her steady, calm temperament and intelligence. Not a thought is given to how responsive she remains to riding aids, and that her skillset allows her to work with beginners as well as more advanced riders. Linda gets a huge amount of credit for maintaining Dolly’s condition and spirit. She knows Dolly dislikes pushy young riders who think they know how to ride. She sagely watches over her mare and teaches students how to ride properly and respectfully, with the horse’s comfort and wellbeing in mind at all times. When Linda encountered Dolly, she had been used as a trail horse. Unfortunately, she was prone to bolting on the trail, so she wasn’t taken out any longer and had nothing to do. Her people decided to put her on Craigslist, where her profile caught Linda’s attention. BN: This is Brigitte the One Who Listens. I am interested in you. I am a translator in people words for horses like you. Would you like to share with me? This is for Linda and all the people who would like to know more about you. Dolly: I am so, so, so HAPPY. I am A VERY HAPPY HORSE. I LOVE AND I MEAN LOVE MY WORK. I LOVE TO WORK. I LOVE TO WORK. If I stand I get very ANTSY. I LOVE TO WORK. Dolly: TO BE WITH PEOPLE. I LOVE PEOPLE. BN: That is a great attribute. What do you teach? Dolly: I teach GOOD HORSE, very GOOD HORSE AND I’M SO PROUD, SO PROUD OF MYSELF. I AM A VERY STRONG MARE, I AM VERY AWARE. I AM. BN: What does Linda need to know she doesn’t already know? Dolly: SHE SAVED ME. SHE SAVED ME. SHE SAVED ME. SHE DID, SHE DID, SHE DID. I AM ETERNALLY GRATEFUL, ETERNALLY. BN: What did she save you from? Dolly: Boredom. I was so, so, so B O R E D. HERE WITH LINDA I AM NEVER, EVER BORED. BN: How do you feel about your students? Dolly: Very responsible. I AM ALWAYS, ALWAYS CAREFUL. BN: What would you like Chris (a 67 year old female student, who started as a totally novice rider with Linda and Dolly three years ago) to know? Dolly: I AM SO PROUD OF CHRIS. SHE IS THE BEST, THE BEST. BN: Can she do anything to improve her riding? Dolly: No, she is doing so well. She has the correct ATTITUDE. Always open, always. Her heart is OPEN TO ME. BN: What would you like to share about rider X? Dolly: Needs to relax, worries a lot. BN: And young rider Z? BN: Do you like teaching rider Z? Dolly: Great, I feel great. BN: Does Linda need to know anything that would improve your life? Dolly: My life is great. I am SO, SO, SO HAPPY (and content). My life is great. Linda explained that she is drawn to the smaller horse breeds such as the Norwegian Fjord Pony, Icelandic Horse and Haflinger Pony because they are bred to like people. Their size is unintimidating and they are suitable for adults and youngsters alike. True to her breed, Dolly does express her love of people in her communication. Recently, Linda found Anni, a pure bred Norwegian Fjord, on Craigslist, to help Dolly out with her workload. I fully expect she will become a lovely, secure riding experience like the rest of Linda’s horses. Linda and Andy moved to San Diego three years ago from the East Coast to be with Andy’s elderly parents. That is when Linda found Dolly and started providing horseback instruction and training in Lakeside. Dolly isn’t alone any longer, as she now lives with Tug (a Haflinger mix), Dallas (a quarter horse gelding), and the newly arrived Icelandic mare, Anni. We are so fortunate to have an instructor with an extensive thirty five year background in the horse world. Linda has worked upper level dressage and show jumping. Has trained her share of horses and is familiar with many breeds. At one point, she was named “Care Taker of the Year” for Standardbred race horses who won under one hundred thousand dollars that year. These horses race driven, not ridden. Therefore Linda can even teach how to drive a cart! Now, that’s something I’d like to try eventually. Linda is particularly pleased with the progress her adult student, Chris Wright, has made over the past three years. When Chris retired from nursing, she decided to take up riding. Today, at sixty-seven, she continues to take lessons twice a week and practices alone one day. I truly feel her level of accomplishment is due to Linda’s insightful instruction and Dolly’s abilities and temperament. The pleasure Dolly and Chris experience during a lesson is undeniably apparent. I’m also an adult rider in my sixties. For years I rode on trails and kept out of the riding arena, so my dyslexia wasn’t an issue. Now I have embarked on a more formal riding experience which involves a lot more instruction and techniques that engage both sides of my body. This causes a complete imbroglio in my head during those times when I can’t distinguish left from right. Linda is a top notch instructor who listens carefully to the horse and the student and knows how to adapt her approach to the student’s individual learning style and challenges. With her guidance, I’m slowly but surely progressing, but more importantly, Linda and Dolly are providing me with an equestrian environment and experiences that are balm to the spirit and heart. Thank you Dolly for turning my small horse “never” on its head. This brings me to my third and biggest resounding “Never”. In 1980, while living in Geneva, Switzerland, I vacationed in San Diego with my first husband. Our San Diego experience, after Sea World and the Zoo, wasn’t the best. We didn’t have a car and were booked into the Hotel San Diego on Broadway at a time when downtown was seedy and dilapidated. In lieu of Horton Plaza, there was a row of old fashioned tattoo parlors, bars, and a few small nondescript smoky convenience stores. We really didn’t experience the beauty of San Diego. For us it was a nasty culture shock and, to top it off, our luggage was held back at the airport by the skycap we had not tipped properly. As our plane was taking off, I swore I’d “NEVER, but NEVER,” come back. When we got to Las Vegas and found ourselves without our luggage, I yelled a few more angry “nevers.” Yet, in a twist of fate, I moved to the United States from Switzerland two years later and drove down from San Francisco in December of 1982 with my future second husband. Our marriage ended and he moved away, but I’ve continued to live here ever since. Now, thanks to my insightful instructor Linda and the exceptional small horse Dolly, I’m happily back in the saddle, riding at a lovely oasis in East San Diego County. Photo shoot and all photos courtesy of Cheryl Erpelding, Erpelding Photography. Joey the Thoroughbred found jumping to his liking and before Cheryl’s medical procedure, he was moved to a facility in the South Bay for more training. I recently learned he was adopted by a young rider and has found a very good home. 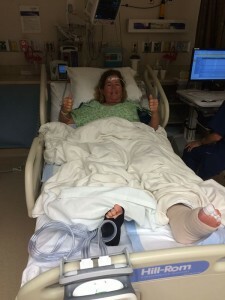 With help from friends, family and the equestrian community, Cheryl Erpelding, who suffers from Lymphedema, raised $86,100 during a two year GoFundMe campaign. This covers her out-of-pocket costs for two procedures to drain the liters of excess fluid from her legs. Cheryl is now recuperating from the second procedure, on her left leg. I see it like a massive lipostuction where instead of fat, excess fluid is removed from the body. The eight week recovery is painful and no fun. The end result is well worth it. She can her manage her condition better and live a more normal life. You go, Cheryl! Thank you for sharing these personal experiences. You always send an insightful and positive message. Nice work Brigitte! Thanks for using my photos! Couldn’t do without them, I so appreciate the photo shoot! So wonderful to read about your adventure, Brigitte. When I was in Norway last year my cousins’ neighbor had an Icelandic horse and I learned how special they are. So it’s especially nice to learn about the Norwegian Fjord. I loved your blog on Norway and your time with your family. Learned a lot about life in general in Norway, food, people, family life.Great pics too! Thanks, Brigitte. I’m happy that you enjoyed my stories from Norway. Brigitte, I am thrilled to hear that you are healthy and vibrant again and riding! How wonderful that you are in such a special place in Lakeside! Brigitte, what a beautiful story! Thanks so much for sharing it. Very inspiring!